It’s time to look at a game that I forgot to review a long time ago. 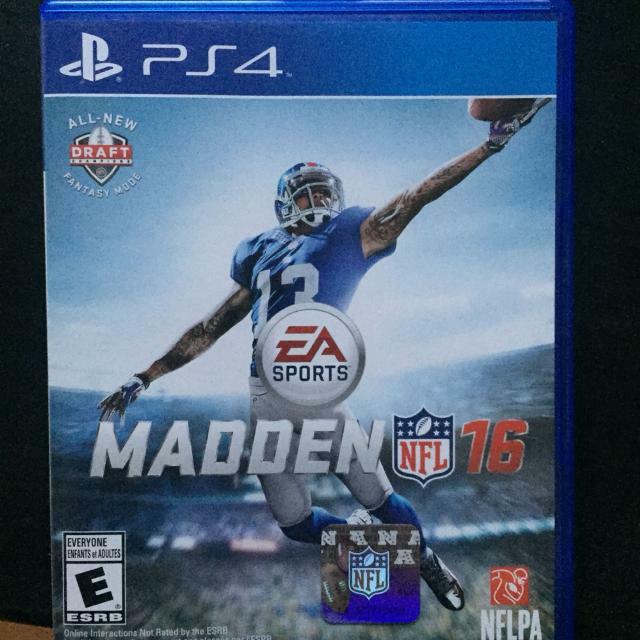 That game is Madden 16. I bought it ages ago but somehow I just didn’t write a review for it. Well, better late than never right? The Madden series is one that I’ve always considered to be one of the very best. There’s a ton of detail put into the game and while it may not change much from year to year, you can still see a noticeable difference if you skip a few games so the changes are there. The gameplay follows the rules of the real life version of the game. It’s the kind of title that is fairly easy to pick up and play but hard to master. The series grew more difficult with each game as new mechanics are added each time. You used to be able to just throw the ball where you wanted and then tackle other players. Now you have multiple ways to throw and tackle to the point where you often are not sure which one to use. They all have their weaknesses and strengths. Personally I think the simpler style controls work better but that’s probably because I’m a casual player. I realize that more times than not, complicated controls are the way to go because it leads to a higher skill ceiling. There’s just a lot to take in. As always, being on offense is the best part. You’re just really in control of the game when you’re playing quarterback. You throw it where you want and it’s not like the computer can force you to toss it. Sometimes a defender will make a crazy play to get at the ball but for the most part any play that goes badly is likely your fault. You’ll realize as soon as you threw the ball that it was a bad idea. Small things like that are what makes this such a legitimate experience. Running the ball seems a little harder than in the old days, particularly in breaking away for super long runs. However you will often pick up at least a few yard which makes for more realistic football. There is one more realistic thing added although I could have done without this. There are a lot of flags in this game. At one point I thought I was watching the NFL because there were flags on almost every play. It always feels pretty iffy when it’s on your team. I had a long touchdown taken back because of a flag like that. Seemed rigged and I wasn’t playing in Cowboys stadium this time so maybe the developers added some extra Home Field Advantage in this one. Playing defense isn’t my favorite thing in the world because you often feel helpless against the computer. It’s mitigated a little by the new mechanics of being on the line and trying to shake the offensive player but at he end of the day it still isn’t quite as exciting. I don’t think it’s an issue with the game though, it’s just a personal preference. At least I appreciate that it is easier to try and make a play on the b-ball instead of jumping helplessly like in previous games. Also you can use super sim to just skip all defensive drives completely. It’d be nice if you could have that feature as a saveable option. Meanwhile special teams is probably the least changed from all of the sections but there really isn’t much to change here. As always the graphics in Madden are very impressive. There’s a lot of detail in every play and the facial expressions are on point. There’s even a nice pre game show and a lot of nice moments throughout that may slow the game a bit but ultimately make the experience that much more realistic. It all feels like a big production and I can say that you will be satisfied when you finally get to jump in. The soundtrack is not very noticeable since the majority of the time you’ll be in the middle of a game where there really isn’t any music. What’s there is the typical EA mash. The tunes are very catchy and all but the lyrics aren’t always the best. It’s pretty much a non factor in the game but better to have it than not I suppose. There are many ways to enjoy this game aside from normal matches. You can go through franchise mode and re-enact a bunch of seasons. You can also go online and prove yourself against a plethora of opponents. There are some rage quitters here which can get a bit iffy though. Sometimes it seems like you don’t get the points that you should have. There are also modes to practice and buy trading cards. The replay value here is basically endless. Overall, Madden 16 continues the series on an elite level. There have been many great Football titles over the years but none have come all that close to Madden as the definitive Football product. It feels like an insurmountable hurdle for any company to hope to achieve. Of course that works out quite well for the players since it’s just such a complete product. This entry was posted in 9 Star Games, Game Reviews, Games, Reviews and tagged EA, EA Games, Football, Game Review, Madden, Playstation, PS4, Review, Sony, Video Game Review by dreager1. Bookmark the permalink. Seriously, glad you enjoyed the game. Heh! Those flags are always trying to get in my way 😀 Thanks!